Parchment, Michigan – Congressman Fred Upton speaks as residents attend a public meeting to learn about PFAS, which has been found in high concentrations in the city's drinking water. Residents have been advised to stop drinking tap water. PFAS is a family of chemicals widely used in firefighting foam, waterproofing for clothing, and many other products. Exposure has been linked to a variety of serious diseases. 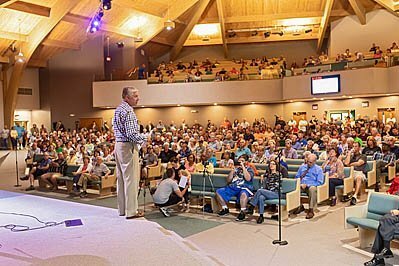 Image Description: Parchment, Michigan – Congressman Fred Upton speaks as residents attend a public meeting to learn about PFAS, which has been found in high concentrations in the city's drinking water. Residents have been advised to stop drinking tap water. PFAS is a family of chemicals widely used in firefighting foam, waterproofing for clothing, and many other products. Exposure has been linked to a variety of serious diseases.